in contrast to pantheism, denies the reality of the universe, seeing it as ultimately illusory, (the prefix "a-" in Greek meaning negation; like "un-" in English), and only the infinite Unmanifest Absolute as real. This philosophy begins with the recognition that there is only one Reality, which is infinite, non-dual, blissful, etc. Yet the phenomenal reality of which humans are normally aware is none of these things; it is in fact just the opposite—i.e., dualistic, finite, full of suffering and pain, and so on. And since the Absolute is the only reality, that means that everything that is not-Absolute cannot be real. Thus, according to this viewpoint, the phenomenal dualistic world is ultimately an illusion ("Maya" to use the technical Indian term), irrespective of the apparent reality it possesses at the mundane or empirical level. is a philosophical position that assigns a negative value to birth. Antinatalists argue that people should refrain from procreation because it is morally bad. any position involving either the denial of the objective reality of entities of a certain type or the insistence that humans should be agnostic about their real existence. Thus, people may speak of anti-realism with respect to other minds, the past, the future, universals, mathematical entities (such as natural numbers), moral categories, the material world, or even thought. tradition of philosophy that takes its defining inspiration from the work of Aristotle and the Peripatetic school. Sometimes contrasted by critics with the rationalism and idealism of Plato, Aristotelianism is understood by its proponents as critically developing Plato's theories. Most particularly, Aristotelianism brings Plato's ideals down to Earth as goals and goods internal to natural species that are realized in activity. This is the characteristically Aristotelian idea of teleology. an organization or a state that enforces strong, and sometimes oppressive measures against those in its sphere of influence, generally without attempts at gaining their consent and often not allowing feedback on its policies. In an authoritarian state, citizens are subject to state authority in many aspects of their lives, including many that other political philosophies would see as matters of personal choice. There are various degrees of authoritarianism; even very democratic and liberal states will show authoritarianism to some extent, for example in areas of national security. also known as "soft determinism" and championed by Hume, is a theory that holds that free will and determinism are compatible. According to Hume, free will should not be understood as an absolute ability to have chosen differently under exactly the same inner and outer circumstances. Rather, it is a hypothetical ability to have chosen differently if one had been differently psychologically disposed by some different beliefs or desires. Hume also maintains that free acts are not uncaused (or mysteriously self-caused as Kant would have it) but caused by people's choices as determined by their beliefs, desires, and by their characters. While a decision making process exists in Hume's determinism, this process is governed by a causal chain of events. the view that reality, or at least humans' knowledge of it, is a value-laden subjective construction rather than a passive acquisition of objective features. named after the title of an 1857 book, Omphalos by Philip Henry Gosse, in which Gosse argued that in order for the world to be "functional", God must have created the Earth with mountains and canyons, trees with growth rings, Adam and Eve with hair, fingernails, and navels (omphalos is Greek for "navel"), and that therefore no evidence that people can see of the presumed age of the earth and universe can be taken as reliable. The idea has seen some revival in the 20th century by some modern creationists, who have extended the argument to light that appears to originate in far-off stars and galaxies, although many other creationists reject this explanation (and also believe that Adam and Eve had no navels). theory of biological evolution developed by the English naturalist Charles Darwin (1809-1882) and others, stating that all species of organisms arise and develop through the natural selection of small, inherited variations that increase the individual's ability to compete, survive, and reproduce. See also History of evolutionary thought. the view that reason, rather than revelation or tradition, should be the basis of belief in God. Deists reject both organized and revealed religion and maintain that reason is the essential element in all knowledge. For a "rational basis for religion" they refer to the cosmological argument (first cause argument), the teleological argument (argument from design), and other aspects of what was called natural religion. Deism has become identified with the classical belief that God created but does not intervene in the world, though this is not a necessary component of deism. A belief or doctrine or philosophical position established by a religion, ideology, philosophical movement, or any kind of organization held to be authoritative and above dispute or doubt such that it is not to be diverged from. A dogmatic position is "established" only according to a particular point of view, and therefore of doubtful foundation. an inclination to rely on or place focus on emotion. a term first used by the Scottish philosopher James Frederick Ferrier to describe the branch of philosophy concerned with the nature and scope of knowledge; it is also referred to as "theory of knowledge". Put concisely, it is the study of knowledge and justified belief. It questions what knowledge is and how it can be acquired, and the extent to which knowledge pertinent to any given subject or entity can be acquired. Much of the debate in this field has focused on the philosophical analysis of the nature of knowledge and how it relates to connected notions such as truth, belief, and justification. The term was probably first introduced in Ferrier's Institutes of Metaphysic: The Theory of Knowing and Being (1854), p. 46.
an aesthetic and artistic movement that distorted reality for enhanced or overexaggerated emotional effect. It can also apply to some literature; the works of Franz Kafka and Georg Kaiser are often said to be expressionistic, for example. pseudo-philosophical theory, developed by fictitious genius Jára Cimrman. It deals with people's knowledge and learning process. doctrine that absolute certainty about knowledge is impossible; or at least that all claims to knowledge could, in principle, be mistaken. As a formal doctrine, it is most strongly associated with Charles Sanders Peirce, who used it in his attack on foundationalism. Unlike scepticism, fallibilism does not imply the need for humans to abandon their knowledge- humans needn't have logically conclusive justifications for what they know. Rather, it is an admission that because empirical knowledge can be revised by further observation, all knowledge, excepting that which is axiomatically true (such as mathematical and logical knowledge) exists in a constant state of flux. In economic anthropology, formalism is the theoretical perspective that the principles of neoclassical economics can be applied to humans' understanding of all human societies. a philosophy developed by Georg Wilhelm Friedrich Hegel. It can be summed up by a favorite motto by Hegel: "The rational alone is real," meaning that all reality is capable of being expressed in rational categories. His goal was to reduce to a more synthetic unity the system of transcendental idealism. a movement in philosophy, started with Immanuel Kant's transcendental idealism, centered in Germany. Many prominent exponents include Georg Wilhelm Friedrich Hegel, Johann Gottlieb Fichte and Friedrich Wilhelm Joseph Schelling. the philosophy of Immanuel Kant and later Kantian and German Idealist philosophers; a view according to which human experience is not of things as they are in themselves, but of those things as they appear to human beings. It differs from standard (empirical) idealism in that it does not claim that the objects of human experience would be in any sense within the mind. The idea is that whenever humans experience something, they experience it as it is for themselves: the object is real as well as mind-independent, but is, in a sense, altered by people's cognition (by the categories and the forms of sensibility, space and time). Transcendental idealism denies that people could have knowledge of the thing in itself. A view that holds the opposite is called transcendental realism. was one of the major ancient religions. Though its organized form is mostly extinct today, a revival has been attempted under the name of Neo-Manichaeism. However, most of the writings of the founding prophet Mani have been lost. Some scholars and anti-Catholic polemicists argue that its influence subtly continues in Western Christian thought via Saint Augustine of Hippo, who converted to Christianity from Manichaeism and whose writing continues to be enormously influential among Catholic and Protestant theologians. absolute version of materialism and physicalism with respect to mental entities and mental vocabulary, according to which humans' common-sense understanding of the mind (what eliminativists call folk psychology) is not a viable theory on which to base scientific investigation: behaviour and experience can only be adequately explained on the biological level. Therefore, no coherent neural basis will be found for everyday folk psychological concepts (such as belief, desire and intention, for they are illusory and therefore do not have any consistent neurological substrate. Eliminative materialists therefore believe that consciousness does not exist except as an epiphenomenon of brain function and some believe that the concept will eventually be eliminated as neuroscience progresses. a traditional branch of philosophy concerned with explaining the fundamental nature of being and the world that encompasses it, although the term is not easily defined. Traditionally, metaphysics attempts to answer two basic questions in the broadest possible terms: Ultimately, what is there? and what is it like? A person who studies metaphysics is called a metaphysician. The metaphysician attempts to clarify the fundamental notions by which people understand the world, e.g., existence, objects and their properties, space and time, cause and effect, and possibility. A central branch of metaphysics is ontology, the investigation into the basic categories of being and how they relate to each other. Another central branch of metaphysics is cosmology, the study of the origin, fundamental structure, nature, and dynamics of the universe. Some include epistemology as another central focus of metaphysics, but other philosophers question this. the belief that human beings, as well as plants and animals, are divine and intricate extensions of nature. Followers share a mutual respect for things created directly by nature, even though life must feed upon life for continuance. While most believers are able to adapt to modern change, naturalists prefer the fair exchange of resources, as was in the case of former agricultural and hunter-gatherer societies. Industry and technology are in exact opposition to naturalism. ideological system that maintains that God and Divine ideas are the first object of humans' intelligence and that the intuition of God the first act of their intellectual knowledge. Note that Martin Heidegger used the term Onto-theology, that is answering questions of being with direct reference of belief in God. either the view that all parts of matter involve mind, or the more holistic view that the whole universe is an organism that possesses a mind. It is thus a stronger and more ambitious view than hylozoism, which holds only that all things are alive. This is not to say that panpsychism believes that all matter is alive or even conscious but rather that the constituent parts of matter are composed of some form of mind and are sentient. in the study of knowledge, particularism refers to the approach where one asks the question "What do we know?" before asking "How do we know?" The term appears in Roderick Chisholm's "The Problem of the Criterion", and in the work of his student, Ernest Sosa ("The Raft and the Pyramid: Coherence versus Foundations in the Theory of Knowledge"). Particularism is contrasted with Methodism, which answers the latter question before the former. Since the question "What do we know" implies that humans retain knowledge, it is fundamentally anti-skeptical. philosophy that originated in the United States in the late 19th century. Pragmatism is characterized by the insistence on consequences, utility and practicality as vital components of meaning and truth. Pragmatism objects to the view that human concepts and intellect represent reality, and therefore stands in opposition to both formalist and rationalist schools of philosophy. Rather, pragmatism holds that it is only in the struggle of intelligent organisms with the surrounding environment that theories acquire significance, and only with a theory's success in this struggle that it becomes true. a Hellenistic philosophy that was the earliest Western school of philosophical skepticism. Like the other Hellenistic philosophies, its objective was eudaimonia, which in Pyrrhonism is achieved by attaining ataraxia (i.e., a state of being unperturbed). Ataraxia is achieved through coming to see that all assertions with regard to non-evident propositions (i.e., dogmas) are ultimately unprovable, thus the attitude one should have of them is to suspend judgment (i.e., epoche). the philosophy that tenets of science should always be criticized and questioned so as to continually prove their worth. the belief that there are no moral facts independent of an individual's or culture's beliefs or desires. Depending on the version of relativism, a given moral statement is true only if an individual (in the case of ethical subjectivism) believes it to be, or if a culture (in the case of cultural relativism) believes it to be. A philosophical concept that states that humans do not (and can not) perceive the external world directly; instead they know only their ideas or interpretations of objects in the world. Thus, a barrier or a veil of perception prevents first-hand knowledge of anything beyond it. The "veil" exists between the mind and the existing world. ideology with the core belief that a society should exist in which popular collectives control the means of power, and therefore the means of production. Though the de facto meaning of socialism has changed over time, it remains strongly-related to the establishment of an organized working class; created through either revolution or by social evolution, with the purpose of building a classless society. Socialism had its origins in the ideals of The Enlightenment, during the Industrial Age/Age of Industrialization, amid yearnings for a more egalitarian society. It has also increasingly become concentrated on social reforms within modern democracies. the view that everything is of an all-encompassing immanent God; or that the universe, or nature, and God are equivalent. More detailed definitions tend to emphasize the idea that natural law, existence and/or the universe (the sum total of all that was, is, or shall be) is represented or personified in the theological principle of 'God'. The existence of a transcendent supreme extraneous to nature is denied. Depending on how this is understood, such a view may be presented as tantamount to atheism, deism or theism. the argument that religious language, and specifically words like "God" (capitalized), are not cognitively meaningful. It is cited as proof of the nonexistence of anything named "God", and therefore is a basis for atheism. There are two main arguments: Kai Nielsen used verifiability theory of meaning to conclude that religious language is meaningless because it is not verifiable, proving weak atheism. George H. Smith used an attribute-based approach to argue that the concept "god" has no meaningful attributes, only negatively defined or relational attributes, making it meaningless — leading to the conclusion that "god does not exist", thus proving strong atheism. the doctrine that "vital forces" are active in living organisms, so that life cannot be explained solely by mechanism. That element is often referred to as the vital spark or energy, which some equate with the soul. ^ Perry, John; Bratman, Michael; Fischer, John Martin. "A glossary of philosophical terms". Student Resources for Introduction to Philosophy (6th edition). Retrieved 22 November 2017. ^ "A glossary of terms". Philosophical Society.com. Retrieved 22 November 2017. ^ "ascriptivism". Ismbook.com. Retrieved 2012-08-15. ^ "Darwinism". Stanford Encyclopedia of Philosophy. The Metaphysics Research Lab, Center for the Study of Language and Information (CSLI), Stanford University. May 26, 2015. Retrieved January 20, 2017. ^ Zalta, Edward N. (ed.). "Principia Mathematica". Stanford Encyclopedia of Philosophy. 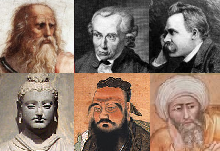 Look up Appendix:Glossary of philosophy in Wiktionary, the free dictionary. This page was last edited on 10 February 2019, at 08:40 (UTC).